Book a coach trip to Liverpool and enjoy a fantastic break in this fascinating city! Famous for its musical heritage, as well as magnificent buildings, beautiful waterfront and lively atmosphere. Liverpool is not only famous as the birthplace of The Beatles, but is in the Guinness Book of Records as the official World Capital of Pop, producing the most number one singles. The city also hosts a variety of major musical events and festivals. Sport is also highly associated with Liverpool , not only for the football, but also because of the rugby league, golf, marathons, tennis, water sports and the annual Grand National horse race held at Aintree. Liverpool has multiple art galleries, museums, gardens, shops and two cathedrals, and is probably the most used film location in the UK after London. So, with plenty to see and do, why not to book a coach trip to Liverpool! If you are a fan of the Beatles, you have to go to the Award-Winning Beatles Story Experience whilst on a coach break to Liverpool. It takes you back in time, and your journey begins in the late 50s. During the visit you will explore the life, culture and music of the Beatles. The ticket of the Beatles Story Experience also includes the Beatles Story at the Albert Dock and the Pier Head. Enjoy the Fab4D Experience, which will take you on an amazing journey with 3 and 4 dimensional special effects. Among other relevant places in Liverpool, you can also visit the Beatles themed Starbucks Coffee house if you want to chill out. 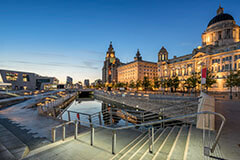 The most popular tourist attraction in Liverpool is The Albert Dock. The Albert Dock is part of UNESCO and made Liverpool one of the centres of world trade in the 18th and 19th centuries, playing a vital role in the growth of the British Empire and the Industrial Revolution. At The Albert Dock, you will find the Tate Liverpool, with a national collection of modern art, The Pier Head, the home of the Mersey Ferries, and the Three Graces (The Royal Liver building, The Cunard building and the Port of Liverpool building) which also form part of the World Heritage Site. The Merseyside Maritime Museum is also located in the Albert Dock. Visit the Titanic, Lusitania and the Forgotten Empress galleries. These ships have strong links with Liverpool and the people who lived in Liverpool (Liverpudlians). The sinking of those ships all happened within 3 years of each other. Visit the museum to explore more about this and learn about Liverpool's maritime past and the Battle of the Atlantic. Liverpool has two Cathedrals. Liverpool Cathedral is the largest cathedral in the UK (in square metres). By doing an audio tour you will learn more about the history, architecture, art, its people and purpose. The tower of the Cathedral stands 154m above the river Mersey and offers you an amazing view. You might see the Metropolitan Cathedral of Christ the King. This cathedral, designed by Sir Frederick Gibberd, is well-worth visiting as well. The building began in 1962 and less than 5 years later in 1967, the building was completed. If you fancy a walk, why not go to Sefton Park, and combine this with a look at the Sefton Park Palm House. This fascinating Glass House has a collection of plants from all over the world. There are many historic parks in Liverpool, including Calderstones Park with its monolithic statues, which are said to be older than Stonehenge. The park is also host to the annual International Tennis Tournament, the Allerton Oak (or Law Oak), and 4000 different species of plants from all over the world. Speke Hall, assisted by a grant from National Museums Liverpool, and administered and financed by the National Trust, is a Tudor manor house, originally built in 1530. The interior is an integrating mixture of Tudor and Victorian times, with wallpaper from the infamous William Morris. Speke Hall's restored gardens are well worth a visit, to embrace the stunning views of the Welsh hills. Dating from the early 18th century, and situated in the heart of the city, the Bluecoat building's architectural importance is illuminated by its UNESCO world heritage and Grade One listed status. The Bluecoat arts centre is over 290 years old and is used to showcase various talents including music, dance, visual art, live art and literature. The Bluecoat also provides a creative hub for people to meet, talk, work, question, perform, create, display and enjoy themselves. Visit the free Walker Art Gallery for possibly the best collection of paintings, sculptures and decorative arts in the North of England, with an amazing collection of pieces dating back as far as Rembrant, Rubens, Millais, Rossetti, Turner and Holman Hunt. The Walker Art Gallery also houses a growing collection of contemporary art pieces, and a specially designed Children's gallery for the under 8's. World Museum Liverpool - formerly Liverpool Museum, is host to The Clore Natural History Centre, Bug House, World Cultures gallery, Weston Discovery Centre and the Planetarium. You can also find out about dinosaurs, fossils and animals from around the world and enjoy special events and exhibitions. The Liverpool Canal Link is 127 miles long, making it the longest canal in Britain, built as a single waterway - yet one of the least busy. Via its connection with the Aire and Calder at Leeds, it offers a coast-to-coast route across the North of England. If you are a fan of Liverpool F.C. football club, you have to visit Anfield. For a unique experience, you can take a tour around the Anfield Stadium and museum. Liverpool, historically a part of Lancashire, is a city and metropolitan borough of Merseyside. It is the fourth largest city in the UK, gaining city status in 1880. Liverpool won UNESCO World Heritage Site status in 2004, because of the impressive waterfront that stretched from Albert Dock along Pier Head and up to Stanley Dock. Liverpool used to be a major port, so you will find people of different nationalities living there. Liverpool was the European Capital of Culture in 2008, and during your stay, you will find Irish pubs, Caribbean restaurants, Chinese art, and much more! If you are considering a coach holiday or coach trip to Liverpool in 2019 the following are a selection of well attended events taking place in Liverpool throughout the year. So if you are interested in attending these events search for your coach holiday to Liverpool around these dates. Whenever you choose a coach holidays to Liverpool you are sure to see many sights and attractions in this great city. If you cannot find a suitable coach trips to Liverpool contact us and let our experienced travel agents help you find your perfect coach trip to Liverpool or any other destination in the UK.